BUY IT NOW, DON'T MISS OUT! Midi length, A-Line shape. Good weight 100% Cotton denim (no stretch). Dark indigo blue. A great looking denim skirt by M&S LIMITED EDITION. Length 27". 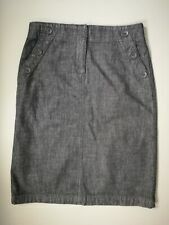 Ladies Size 10 Denim Skirt BNWT . Condition is New with tags. Dispatched with Royal Mail 2nd Class. Soft denim type cotton fabric with stretch. A-Line shape, just below knee length. A terrific casual skirt by M&S CLASSIC. Length 26.5". Back zip & button fastening. Off white colour. UK size 14L. Boden blue denim a-line skirt. Length - 25.5". LADIES BLUE YES YES DENIM SKIRT. FAUX POCKETS ON THE FRONT AND BACK. Two pockets to front. black buttons. M&S blue denim aline skirt. Waist: 29". Length: 25". By CALVIN KLEIN. below knee Distressed Denim A line skirt. Don't miss ! 100% Cotton. 64cm full length. Skirt length approx 13.5" and width at waist approx 15", zip and popper fastening, good condition. CREW CLOTHING COMPANY SKIRT. Dark denim, knee length, pockets. UK 8, waist ~ 29"
Size: UK 8. UK £3.50 (£3.00 50p). Ladies Front Buttoning Denim skirt, Size 10, excellent condition If you have any questions please message me and I'll be happy to help. Postage is by second class post and I'll get proof of postage when I send your item. If you need speedier delivery let me know as this can be arranged for an additional charge. FITS APPROX UK8. DARK BLUE SLIGHTLY TEXTURED DENIM SKIRT. TRAFFIC PEOPLE. MACHINE WASHABLE. Denim (Blue). Machine Washable. 100% Cotton. Front Zip & Button Fastening. A line Denim Flared Skirt - Midwash Panelled Jean Skirt Midi Skirt 14. Zip at the side. Good used condition Dispatched with Royal Mail 2nd Class. Ladies Denim A-line Mini Skirt. Size 28 (UK 10). Press stud closure on the side. Length 24" incl.waistband. 2 front pockets, 2 back pockets. Womans weird fish in blue denim a line skirt size 10 used excellent condition with front and back pockets Condition is Used. Colour: Faded Blue Denim Size: UK12. Fat Face Contrast Denim A-Line Midi Skirt. A-Line skirt with contrast godet-inserts. Faded denim blue with undertones of pink. Skirt Details Jean-styling front zip fastening and pockets. Lovely blue denim skirt by MNG Jeans. Waist side to side -14" to 14.5’’. I will try reply ASAP. I try to list the item honestly but I am human and can make mistakes. Used in good condition. Colour: Stonewashed Denim Blue Size: UK12. Principles A-Line Denim Skirt Over-the-Knee 26.5"L. Panelled A-line denim skirt. Smart Casual Weekend Wear. Material: 100% cotton. Designer KAREN MILLEN A-line denim skirt UK size 10 knee length mid blue Front pockets The buttons on the front has been scratched please see pictures. Denim A-line skirt. Nice casual denim skirt. H&M / Divided. Knee length. Blue denim Relaxed Mini skirt. Don't miss ! Size 12 UK / 40 EUR. 99% Cotton. 46cm full length. Dark Blue Denim YESSICA Zip A-Line Knee Length Casual Skirt. Size - UK 10 EU 38. SKIRTS LENGTH - 24" OR (61 CM ). WAIST - 14.25" OR ( 36.2 CM ) ACROSS THE BACK. I REALIZE THAT BUYING OVER THE INTERNET ISN'T EASY AS YOU CANNOT HOLD THE PRODUCT OR TRY IT ON. From: Jack Wills. Freshly laundered so ready to wear. Lovely denim skirt. Lovely little denim skirt, feminine simple elegant. Colour: Mid blue denim. Length 19". Not too short so you will never feel uncomfortable sitting down / getting our of your car. Denim (100% Cotton). A Line Mini Skirt. Perfect for any season and event. 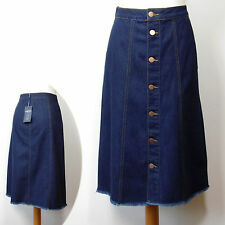 Ladies Fat Face Blue denim A line Knee length Skirt. Nice intergrated Belt detail, popper and fly closure. Classic A line denim skirt with pleats by Cotton traders. Length 22" waist 30". Flattering fit & easy to wear. Used but in good condition, lots of wear.